About a year ago, not long before my book promotion handbook Sell Your Books! went to press, I was bowled over by an audacious publicity ploy called National Flash Fiction Day (NFFD). I was late coming to the party, but not too late to pick up some free downloads that drew me further into the genre. Before long, I’d befriended two great flash writers, Helena Mallett and Bart Van Goethem, who I interviewed on Off The Shelf a couple of weeks ago. I’ve even started writing it myself. You can imagine how pleased I was when one of my flash stories, Clean Linen, was selected for the edition of FlashFlood Journal that went live on NFFD itself. This year, when the publicity fanfare started up for the second National Flash Fiction Day, I was delighted to discover that one of the biggest national celebrations of this diminutive genre would be taking place just half an hour’s drive from me, in Bristol. So, feeling self-consciously artistic, and wondering whether I should be wearing a beret, a turtleneck sweater and smoking Gauloises, I sloped off to the upstairs room of the designated pub to join in the fun. 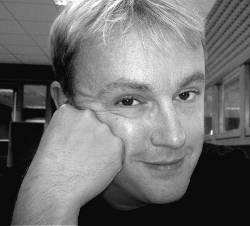 There I met Calum Kerr, writer, editor, lecturer and director of National Flash Fiction Day in the UK. He was celebrating the publication of his latest book, Lost Property. Good thing I’d foregone the existentialist poet outfit, because Calum turned out to be a jovial, cheery chap in a Dr Who t-shirt. I also met his lovely writer wife Kath, to whom, as a wedding present, he gave a published book of her own flash stories. How cool is that? I’m very pleased to welcome him to Off The Shelf today to tell us all about how and why he invented this special event, where it’s heading next, and how it ties in with the promotion of his own excellent collections of flash fiction. Debbie: First of all, why flash fiction? What do you love about it? Calum: I love the way that a small story can conjure so much more than the words on the page. By implication and by tapping into our knowledge of life, the universe and the way in which stories work, they can create something huge in as little as a hundred words. Or fifty. Or fewer! I love the power of that. Debbie: How much time and effort did it take you to launch the first NFFD and how many other people were involved? Calum: In the first instance, it was just me. I had the idea around the time of National Poetry Day. I was looking to see if there was a day for flash-fiction that I could be involved with. There wasn’t, so I asked around among some flash-fiction writers that I know to see if they would be interested. They were, so I set to. I set up a website, email address, Facebook page, Twitter account, picked a date, and started encouraging people to be involved. For the first few months it was a hobby, but it really took off and grew beyond all expectation. I brought other people on board to help with various projects that I thought up, such as the FlashFlood journal and the anthology, and after we got some funding I was able to pay a part-time PR person to help out. In the end it was my job to co-ordinate the whole thing, with loads of volunteers running their individual events and competitions. In the run-up to the first NFFD, I was putting in 18 hour days doing that. It was exhausting, but worth it. Debbie: What were the three most effective things you did to bring the event to public attention? Calum: I think the most effective was social media, it gave me a huge reach and led to events happening in Australia, New Zealand, Ireland, America and beyond. I could never have reached those places without Facebook and Twitter. Traditional media was also useful – I managed to get onto BBC Radio 4’s IPM programme and Radio Solent to promote the day and other organizers of events were on their local radio stations and in their local papers. David Gaffney, a writer from Manchester, also had an article in The Guardian. These were great methods of promotion. And finally, it was the individuals. Dozens of events and competitions were run by volunteers and they used their various media outlets, social and traditional, as well as good old word of mouth, to spread the word. Debbie: How long have you been writing flash fiction? Calum: Well, the answer to that depends. The first ever stories that I submitted to a magazine (a thing called FEAR that ran in the 80s) were tiny things of about 50 words. So you could say I have always written it. However, I first came across the term in a workshop at a conference in late 2009, run by Vanessa Gebbie. In that workshop I wrote two flashes which were acclaimed by other members of the workshop. Both of those have since been published, and both appear in my new collection, Lost Property. Debbie: How has the flash community changed since the first NFFD? Calum: One of the things I found when organizing the first one was that many flash-fiction writers were doing so in isolation and if they were aware of other writers, didn’t know much about them, or what they were up to , and weren’t in contact with them. NFFD has very much brought them together and it feels now like there is a coherent community of flash-fiction writers. That’s something I’m particularly proud of. Of course, now it has a day and is all ‘official’ some people have decided to pull back a little and are questioning, if not the form necessarily, then the strictures put on it by the name and definitions. But, that’s writers for you. We don’t like to be pigeonholed! It all leads to healthy debate though, and that can only be a good thing. Debbie: Tell us about your IPM experience – as a huge fan of the lovely Eddie Mair, I am dead jealous of your hook-up with him! After that, I devoted the December portion of my project to using those same Your News items and they took 22 of them, had proper actors record them (Rory Kinnear, Emilia Fox, Kenneth Cranham and Dame Diana Rigg) and put them out as a whole edition of iPM on Christmas Eve 2011. That was amazing! I got to be interviewed by Eddie again for National Flash-Fiction Day, when they had me write a story during the recording of a show from a prompt they provided. It was a veritable roller-coaster ride and a wonderful one. Debbie: What’s your favourite length for writing flash fiction? Calum: I don’t aim for a length, I just write, but the majority of mine slot in somewhere between 300-500 words. I think, if they get longer than that, then they are moving away from true ‘flash’ and up towards a short story. I can and have written pieces shorter than that, but they tend to be that length after editing, rather than emerging at that length. iPM required stories of about 200 words, so lots of editing took place with those stories. I’m rather proud of those ones, though, I think they are better for the extra concision. Debbie: Flash encompasses a huge range of styles and stories, from highbrow literary to surreal flights of fancy to down-to-earth one-page stories for popular women’s magazines. Where do yours fit it? Calum: Well, in the course of flash365 I attempted to write in as many different styles, perspectives and genres as I could, so I probably did all of those and more. I found, though, when I looked back, that I seem to shift between the literary and the genre. I like dark stories, and metafiction is something I keep coming back to. That said, my most popular stories with readers are my version of a 1950s radio adventure serial. I don’t know where you’d categorise those. Debbie: How on earth do you find the time? Calum: I don’t know. Eighteen hour days, and nowhere near enough sleep. And for a lot of that, I was teaching and marking at Winchester University. In fact, on the morning of NFFD 2012 I finished a batch of marking before I headed up to the university to host a write-in. I used my visit for the latter as a chance to drop off the former. That’s one of the reasons why the Day was a month later this year, to avoid the clash with assessment season. Debbie: You gave your wife Kath, also a writer, a book of her own stories as a wedding present – did flash fiction bring you together? Calum: It was one of the things. When we met we discovered that we both had a shared love of books and of writing. She wasn’t really that aware of flash-fiction but once I told her about it, she encouraged me with my work in it, came up with lots of ideas that helped, supported me with flash365 (and was, in fact, the instigator of its fore-runner, 31) and NFFD, and then, when I finished flash365, she took on the challenge herself. We got married a couple of months into her project, so I took the first month and made them into a book. It seemed appropriate. She completed her 365 stories on 30th April 2013 and did a fantastic job with them. We resurrected our projects for NFFD this year, writing a story a day each for a week, and the moment we were done, on the Friday, I turned them into an e-book, Mr & Mrs Flash which I was able to make available the next day, in time for NFFD. Debbie: What’s your favourite story in your new collection and why? I’m very fond of ‘Soaring’, the title story of the second section. It captures a beauty which I think I often strive for, but seldom reach so well. But I’m also fond of ‘Who’s the Boss?’, one of the iPM shorts, about a cat who is in charge of his owner. I love the character of the cat, and keep planning to turn that 180 word story into a full radio play. But, well, all of them. Yes, all of them. Debbie: I love the way you’ve grouped your stories together by theme within “Lost Property” – and the notion of “pamphlets”. It takes a lot of flash to fill a whole book. Do you think pamphlets are the way forward (or e-pamphlets) for flash writers or should we all be saving up enough to fill a hundred pages or so? Calum: Both. Is there not room for both? I think a pamphlet is a very fine thing for flash-fiction. It allows 10-20 stories to be gathered together, produced at low cost and sold at a low price. As with poetry pamphlets it is a really good entry level into being published. But, just as we have full books of short-stories, why not full books of flash-fictions? They are the next step up from the pamphlet and allow the writer to range wider and do more. I think, once a reader gets to understand the form, they will find that a collection of, say, 80 flash-fictions, can give them the same sense of world and story as the same number of novels. Debbie: I understand that US flash writers would like to share the next NFFD – I love the idea of a “flash around the world”. Will you now be taking it global? Calum: Well, we already are global. Collaboration between us and New Zealand is now a normal thing, and this year saw the second annual event in Dublin. I tried to get into the US last year, but it was hard finding the person who could make things happen. That breakthrough came just before this year’s Day, so a bit too late to do anything, but talks are happening now and it looks good for next year. Taking over the whole world is a bit too much, even for me, but having a series of National Days that occur on the same date, and who share promotions and opportunities is much more manageable. Debbie: What impact has being director of NFFD had on sales of your own collections of flash? Calum: You know, I have no idea! I have had requests for stories from magazines because I am the director, and I think it has helped with getting things into print. But I think that the Radio 4 connection – which pre-dates NFFD – did just as much, and that my constant use of social media does a lot too. So, I don’t really know, but then again, that’s not why I do it. Debbie: Any other exciting future plans you’d care to share with us? Calum: Well, as well as all this, I run a small publishing house – Gumbo Press – which produces flash-fiction pamphlets. I plan to continue with that. I’m also finishing off a novel for which I have high hopes. But I think, for the moment, I don’t have any huge ideas. Though, from time to time, I think about starting another 365. Writing those flash-fictions is just addictive! Debbie: Finally, with your university lecturer hat on – what is the difference between “literary fiction” and “fiction”? Lately I’ve seen some work classified as “literary” that struck me more as common-or-garden fiction, or even chick lit. Are the lines blurring or is there an easy way to tell? Calum: I have a hard time with this one myself. I think a sometimes a piece becomes classed as ‘literary’ once the writing style reaches a certain syllable count! Sometimes, it’s to do with the story not being just about ‘normal’ things, but larger issues being addressed. Sometimes it’s just a way to differentiate realism from genre writing. But, as someone who writes in all genres, I’m maybe not a good person to ask. I see ‘good writing’ and ‘bad writing’ and what genre it’s in doesn’t really bother me. 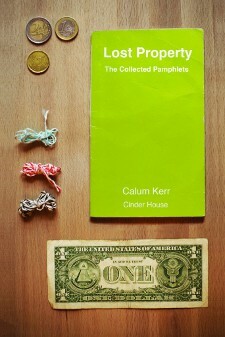 Click here to visit Calum Kerr’s website where you can order copies of Lost Property and his other books.